Chris worked for Mattel on the hotwheelscollectors.com website and message board. 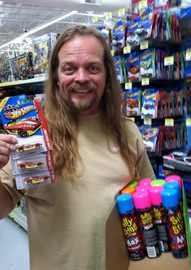 He is a frequent attendee of the various Hot Wheels conventions and would work at some of the events, including the RLC party and vending machine sessions. Known to spray silly string at vending machine winners. If you see the remnants of silly string at these events, you can be sure Chris was around.